Hollywood's rising leader Touré Roberts continues to make a positive impact in his community for young people and adults as a voice of vision, hope, and purpose. Having over 3500 members who attend his weekly One Church in Hollywood, it is evident that Roberts is following his purpose and calling to serve a creative and professional community who is serious about their passion for creativity; nonetheless, to inspire and touch the hearts of people from all walks of life. Roberts recently released his new book Purpose Awakening in which he classifies as a purpose manual, a manual guide to life. His goal for the book is to help people to live a better life along their journey as they transcend through life. 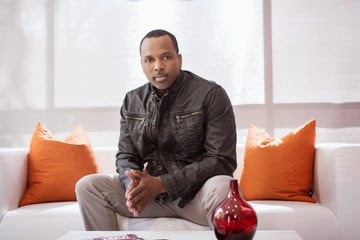 Here is what Touré Roberts shared with the Consciousness Magazine readers during a recent interview about his passion for his endeavors, which consist of his desire to give back and help people excel in life. Aaron Robinson: What was it that inspired you in your life allowing you to want to make a positive change in other peoples lives? Touré Roberts: There is a lot to it. You know, one of the things I talk about in my book, I was actually 16 years old…I got shot and I nearly died. This happened in the late 80’s when people were being murdered and killed so much that the term ‘drive by shooting’ derived, they just made up that phrase. It was like the drive-thru restaurant. That’s how commonly murders were taking place. So, I could have surely been a statistic. I look back over my life and I realize that I’m still here. There has to be a reason that I’m still here. I just don’t take life for granted. And then I just believe in people. I believe that anyone who is encouraged and given the opportunity can excel in life. Since I’ve been gifted with the ability to communicate, the ability to be compassionate toward people and the ability to motivate, then I want to use all of those gifts with the time that I have left to make a difference in the world that I’ve been put in. Aaron: You have a new book called Purpose Awakening. What was the motivation behind writing it? Touré: I know that the question of purpose is one so many people have. They may not call it purpose. They always might question ‘Am I doing the right thing or should I be doing something else with my life?’ So, I wanted to answer that question. The second reason is, I’ve seen what’s been awakening to my own purpose. I’m motivated, I’m alive, I’m happy and I’m fulfilled. I wanted to write something that will help people come into their own sense of purpose and their own sense of happiness. Aaron: What can readers expect or walk away with after reading your new book? Touré: First of all, it will help them [readers] to demystify purpose. You have so many people that don’t even know if they can ever find their purpose. So what I think people are going to walk away with, many are going to be really awakened to if not their purpose specifically, perimeters that will guide them to their purpose. They are going to learn a lot about relationships, they are going to learn about how the past and the present and how all those things are playing a part in their purpose. They’re going to learn a lot about loving themselves. They’re going to learn a lot about fear, so fear won’t hinder them. Aaron: You have a free center called The Artist Resource Center (ARC). What led you to creating this center? Touré: Well, in the spiritual community that I lead, 90 percent of those people are all in art or entertainment - from people who are just getting started to people that are very successful already. I recognized many artists that are just getting started and can’t afford the hardware to create. What I wanted to do was create a very high-end state-of-the-art creative space. We have three of those spaces, where artists can come in free of charge and they can use the computer lab and use the editing suites. I also do free seminars and free workshops. I have a lot of friends in the business and so on. I leverage those relationships and have those executives come in, successful producers come in, and successful actors come so they can help accelerate the success of those who are just getting in the business. Aaron: You also help actors, musicians and artists. Is that in relationship to The Artist Resource Center (ARC) in regards to what you have available for artists and so on? Touré: Yes, the community that we lead, there’s a few thousand people in that community. Many of them have been raised up in the Artist Resource Center; many of them were not. So they [the ones who were] come back and they are able to give back to others. But, it’s definitely connected to the arts. Aaron: What valuable information would you share with those individuals who are seeking to find betterment in their life; nonetheless, are still facing unfriendly challenges in their life? Touré: I believe that it really all comes back to purpose. I believe that if you are to pursue the reason why you are here, you’ll find out. 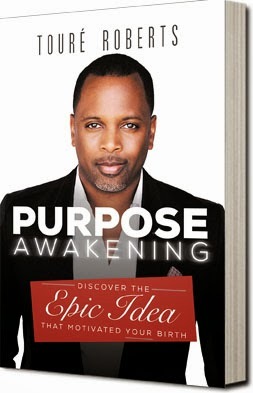 The title of the book is called Purpose Awakening, and the subtitle Discover the Epic Idea That Motivated Your Birth. Every life didn’t start randomly; every life began with a brilliant thought. And when you find out that thought and you begin to align your life with your purpose and with the reason why you’re here, then there’s no reason to fear anything because nothing in life can stop you to live out the purpose for which you were created. Aaron: In regards to your book or anything that we haven’t discussed, would you like to add anything in closing before we end the interview Mr. Roberts? Touré: Only that, one of the things to know about purpose is that you don’t find purpose, it finds you. It’s always there with you. And I think this book is really really going to open people’s eyes. It’s doing very well. Purpose your passion and perseverance, and it will pay off in the end.